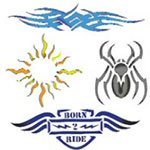 All body painting stencils are made from a thin clear film with a tacky backing. The patterns are laser cut. Use is of course not restricted to just body painting. All images show what a certain pattern looks like after paint is sprayed on the stencil. Each sheet contains multiple cut-outs of the same pattern. The Theme Packs contain 6 sheets of a series of with various patterns. The fingernail stencils are re-usable and laser-cut from thin and flexible mylar. Each stencil is approx. 12cm (4.5") in diameter. Each package contains one stencil. Various types of stencil film to cut your own stencils. 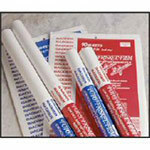 Available in cut sheets or rolls, matte or glossy, with light tacky backing (Low-Tack) or No-Tack.